The PaK40/3 auf Sfl.38 Ausf. H (or Marder III H) is a Rank III German tank destroyer with a battle rating of 3.0 (AB/RB/SB). It was introduced in Update 1.47 "Big Guns". The Marder III H is a step above the basic Marder III. 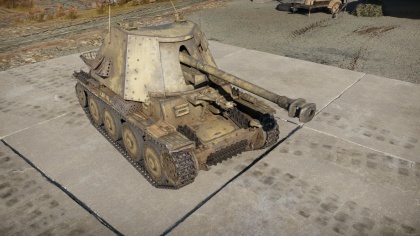 As it is in Germany's open - top tank destroyer line, it's calling card is it's superb firepower; in fact, it has the most powerful gun for the battle rating 2.0 - 3.0 - 4.0 range - APCBC is almost always enough to penetrate and destroy any tank on the battlefield, and with APCR, it has the highest penetration of any tank for it's battle rating range - even at battle rating 5.0 your gun will remain competitive. The Marder III Ausf. H mounts a 75 mm gun surpassing those on the late Panzer IV's, thus its only disadvantages are its weak armour and its open encasement. Being a modified Pz.38(t) tank, it is one of the more mobile of the German tanks - nearly matching some Russian tanks. It has a better gun close-range wise and has better armour coverage, being curved to the sides, unlike the earlier Marder III. Ammo racks of the Marder III H.
Since you are an unprotected tank from behind, try to be as far from the action as possible. If getting close to enemy tanks cannot be prevented (Urban maps, Allied retreat etc), then try to hide at least a part of your hull against a wall or rock. Use the horizontal range of the Marder III H as much as possible - as a turret-less SPG, it has excellent - if not the best - gun traverse for any turret-less SPG. This tank destroyer can be penetrated easily; it has next to no armour at it's battle rating. keep close to other tanks to prevent this in urban maps, and stay close to cover in other maps. Also, be careful when being targeted by Artillery; one close hit on your rear and you can be destroyed by shrapnel. Another important thing to take into account is the fact that ammunition is stored in the nearly unarmoured gun shield - nearly any vehicle in the game - with the notable exception of the GAZ-AAA (4M) - can penetrate this tank with ease. To get Ammunition out of the turret, bring only 32 shells, leaving the "turret" basically empty - 32 shells is more than enough. Another fact to take into account is that nearly all shells will over penetrate the "turret", with no damage, a crewman knocked out or 2. First off, research Parts to fix and vehicle damages, especially the gun barrel because it is very easy to get damaged in the midst of combat. Get the Horizontal Drive to move on to the next tier for the FPE. Any over penetrations will critically damage, or set alight, the engine, immobilizing you and destroying you if the fire is not put out. Lastly, go for Adjustment of fire - as one may find the gun of the Marder III H as inaccurate at times. Outstanding gun for its rank. Armour that protects crew from MG fire, but thin enough to allow normal AP rounds to over-penetrate. Fairly small tank destroyer, can hide behind most obstacles. Excellent horizontal arc of 30°, that allows to hide easily the tank. Amazing penetration with APCR ammunition. Not fully enclosed (Exposed crew). Extremely high penetration that it often over penetrates most light tanks that it faces. After the start of Operation Barbarossa, the Wehrmacht found a very dire problem of the lack of a mobile anti-tank system and adequate anti-tank weapons, especially after the appearance of the Soviet T-34 and KV-1 tanks. The only mass-issued anti-tank was the 37 mm Pak 36 and the only mobile anti-tank system widely used was the Panzerjäger I with the Czech 47 mm anti-tank gun. Modifications to current vehicles in service was done to put more self-propelled anti-tank weapons into service, which created the Marder I from the French Lorraine, the Marder II from the Panzer IIs, and the Marder III from the Czech Panzer 38(t). The Marder III Ausf. H uses the Panzer 38(t) as it was a design going obsolete, and new large German anti-tank weapons were being produced, so they mounted these guns onto the Panzer 38(t) first. The finished self-propelled mount had a higher silhouette than the Panzer 38(t), which left it more vulnerable, but had a 75 mm Pak 40 gun and with hold 38 rounds in the vehicle. A machine gun on the hull was retained for anti-infantry purposes. The Marder III Ausf. H predecessor, simply named as the Marder III mounted a rechambered 76.2 gun instead of a Pak 40. 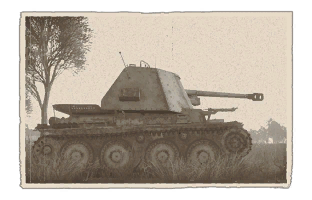 Another variant created, the Ausf. M, featured a lower silhouette and a better sloped armour and fighting compartment, despite only holding 27 rounds for the mounted Pak 40. A total of 3,472 Marder IIIs and its version was created or converted from Panzer 38(t) during its production life. The Marder III Ausf. H fought on all front of the war, being produced from 1942 to 1945, with 450 Marder III Ausf. H with the Pak 40 converted and produced. Using the tested design of the Panzer 38(t), the Marder III experienced a reliable mechanical history, and has a gun that could take out most allied tanks in the war. The vulnerability to the crew due to lack of armour was its most pressing issue, with only a front shield plate at most 15 mm thick and side plates that can't enclose the crew. This makes it as very poor assault vehicles or tank substitutes as the open top could allow infantry to easily kill the crew from hidden areas, despite that, it is sometimes repurposed to this role to the chagrin of the crew. As its production was underway, Germany already had a few self-propelled assault weapons being produced such as the StuG III that could have the same anti-tank capabilities, yet was fully armoured, enclosing the crew in adequate armour. This obvious advantage over the open Marder series encouraged the development of a new kind of tank destroyer from the Panzer 38(t) with better armour, which will eventually create the Jagdpanzer 38(t). Despite that, the Marders continued to serve to the end of the war.